A huge thanks to Peter Finnan from Irish Golfer Magazine. Had the pleasure of meeting Peter at the PGA Show in Orlando last January, and after speaking with him, it’s obvious how passionate he is about promoting all that is good about golf in Ireland. He offered to do an editorial about my journey as an inventor, clubmaker and the Aidhm Putter brand, and one week before the US Masters, he’s come good on his word and we are featuring in the April issue of Irish Golf Magazine. 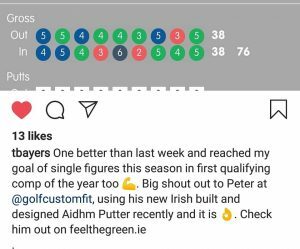 Peter, thank you again for doing the article, as it gives us ample opportunity to show that Aidhm Putters can hold it’s own in a world of mass produced golf equipment, and that as a country we can box well above our weight when it comes to producing a quality golf product. Neans McSweeney you never cease to amaze me how good you are as one of Ireland’s top PR Consultants, I’m so grateful for all your hard work over the years.